The Trends page ( Budget & Reports > Trends) can quickly show you where you're at with your budgeted (and unbudgeted) categories. You can easily see how much you have left to spend and quickly detect overspending in a particular category. You can then readjust your future budgets to more accurately reflect your earning and spending! You can use the Trends page to see and compare your overall earning and spending or you can select and analyze your specific categories. We'll break down your trends into a bar graph. This makes it easy to see how much you've earned or spent as well as how your tracking in your budgets. The Trends graph is color coded to help you see where you're saving, overspending, receiving refunds etc. Each color represents different information and these color keys are shown at the bottom of the graph. The horizontal dotted line highlights your average earning or spending amount for a category (or categories), relative to the date range being displayed. This line gives you a reference point to help you decide whether you're setting your budgets at the right amount. It's easy to edit a budget straight from the Trends page! Just select Edit budget from the toolbar. Hover over bars on your chart for more detailed information. Select the budgeted amount to see your budgets from the period reflected in the bar. Select the spent, or earned figure to see your actual transactions made during that period. Switch between expense and income using the toggle in the toolbar. From the side panel, you're able to choose from a variety of options to better understand your earning and spending trends across different categories! You can select Trends to analyze your overall earning and spending in all categories or select specific parent categories. You can also drill down into categories and sub-categories. A green dot is shown next to categories that have budgets. If you nest sub-categories under parent categories you can use the Roll up toggle to see your overall trends in a parent category! 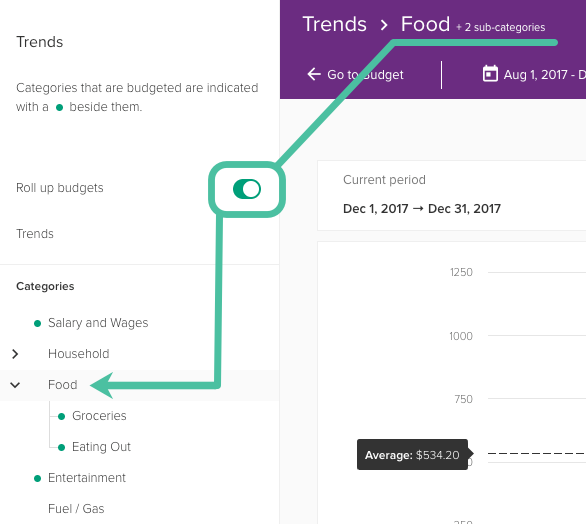 For example: If you have a parent category called Food, with sub-categories Groceries and Eating out, you can choose to see your overall trends for the Food parent category by switching the Roll up toggle on. With the Roll up toggle turned off, the totals for Food will exclude any of its sub-category values. Using the Roll up toggle is especially handy if you only use parent categories as an umbrella category and don't assign any transactions to parent categories. In this case, with Roll up toggled off, there will be no data to show for that parent category. Just, toggle Roll up on and the Trends graph will include the nested categories! Then use the View by menu to select a particular period to break down this date range by, such as Month Period, Year Period, or Budget Period. 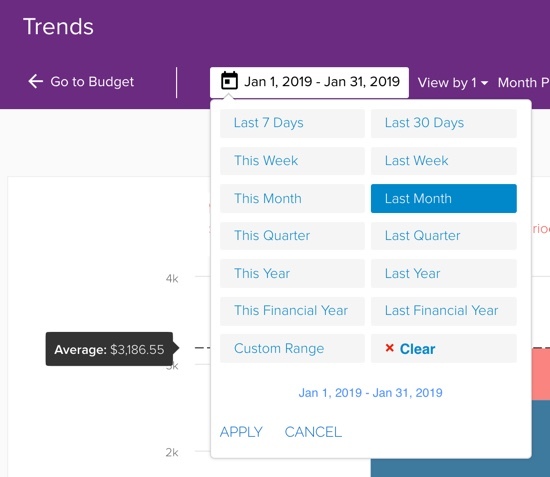 If you set up budgets for a category and select Budget Period from the View by options, the Trends page will show a breakdown of that category by its budget periods. If you have not created a budget for a category or if you have multiple budgets for the one category, the Budget Period option will not be available. There are two main types of categories in PocketSmith - bill categories (and scheduled income categories) and non-bill categories. 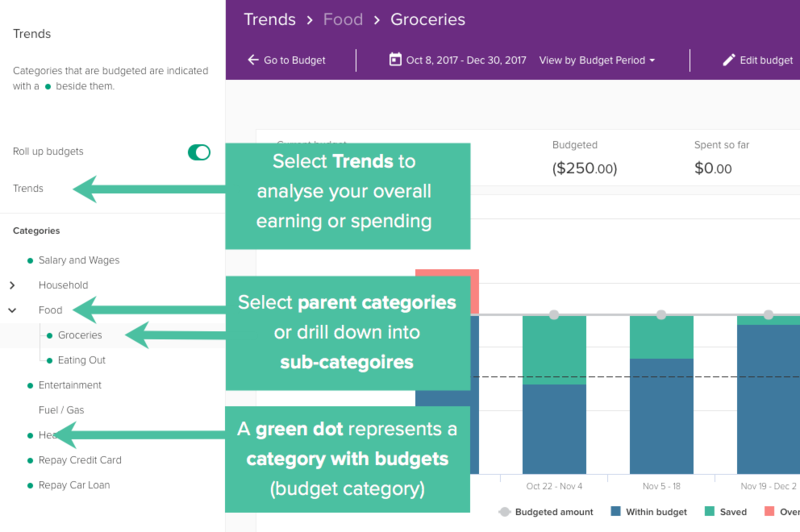 The main difference between the two is how budgets for each category type are treated and displayed on the Budget page and the Trends page. You can choose whether a category is a bill or scheduled income category, or a non-bill category when editing the category. John has a $90 expense budget for his 🍬 Treats category that runs from November 1 - November 30. However, John has set his Budget Summary date range to show from November 1 - November 14 and has ticked Apply this date range to the entire Budget page. Because PocketSmith will evenly distribute this $90 budget across November 1 - November 30, once John has decided to apply the date range of November 1 - November 14 to the entire Budget page, the budgeted amount showing beside his 🍬 Treats category will only be for $42. Sally has a budget of $90 for one of her bill categories called ⚙ Insurance. She started this budget on November 1 and it is set to repeat every three months. Sally sets the budget summary date range to show from November 1 - November 14 and has ticked Apply this date range to the entire Budget page. PocketSmith will not distribute this budget amount of $90 across that three month period, and instead, only considers the bill to take place on November 1st (and then again on the date three months later). So once Sally has decided to apply the date range of November 1 - November 14 to the entire Budget page, the budgeted amount showing beside the ⚙ Insurance category will be the full $90.